Zoe Glass has been writing journalism, essays and fiction since 2001. Her articles have been featured in publications including literary journals "Beatdom" and "Denali," the music magazine "Mixmag" and the London newspaper "Snipe." Glass holds a Bachelor of Arts in English from the University of Pennsylvania and is studying for a Master of Letters in writing at the University of Glasgow. Time is precious, and when you are trying to lose weight, it is important to get the maximum results from your gym workout. If you want fast results, you need to go to the gym with a specific workout planned — this keeps you focused, prevents distractions, and helps you burn the most fat and calories in a limited time. It is also a good idea to hit the gym when it isn’t busy — that way you don’t waste time waiting for machines. Two or three running sessions a week are an excellent way to lose weight, notes Johannes Roschinsky in “Fat Burning: Exercise & Diet.” The key is to do your sessions at high intensity. At least one run per week should be an interval-training session. This will help you lose weight fast because it increases the total distance covered, and therefore the amount of calories burned. For example, try running for two minutes at an easy pace followed by a one-minute sprint, then two minutes easy, and repeat five times. Circuits push your body to burn fat faster because they engage both your muscles and your cardiovascular system. Personal trainer and military fitness expert Stew Smith recommends a 20-minute circuit workout that incorporates one minute each of pushups, squats, pullups, shoulder presses, biceps curls, triceps curls, and leg extensions and curls, plus situps, crunches and jogging. This short but intense workout is beneficial for weight loss because it targets all of your major muscle groups in minimal time. The elliptical trainer is a good alternative to running if you are heavier because it is non-impact. Elliptical manufacturer Precor recommends a weight-loss program that works all of the major muscles in your legs, including your calves, thighs and buttocks, and trains your muscles to burn fat. Warm up at a low incline, then do 15 minutes at 65 to 75 percent of your maximum heart rate, and cool down for two to three minutes. As you build endurance, increase the duration of your workouts to 45 to 60 minutes, and vary the resistance for bursts of high-intensity effort. Weight training is key to weight loss because building muscle boosts your metabolism, according to the American Council on Exercise. Choose compound exercises that work multiple muscle groups at once. Squats, deadlifts, lunges, shoulder presses and bench presses can be performed in the same workout to target nearly every muscle in your body. 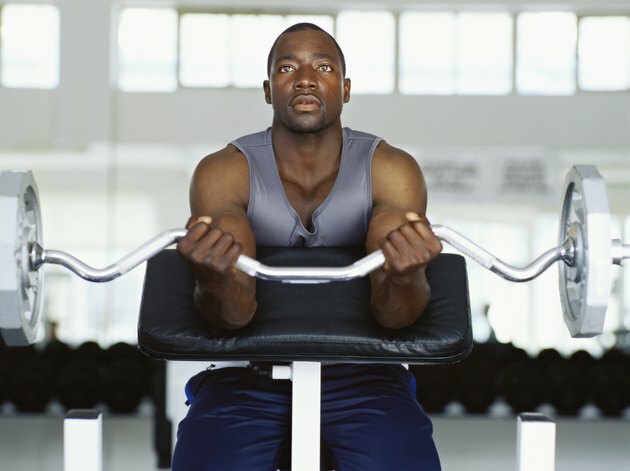 Perform two to three sets of eight to 12 reps of each exercise with less than 90 seconds of rest between sets. Aim for three sessions of weightlifting per week with at least 48 hours of rest between sessions.